Recombinant monoclonal antibody to carcinoembryonic antigen (CEA). Manufactured using AbAb’s Recombinant Platform with variable regions (i.e. specificity) from the hybridoma Arcitumomab. Immunogen: Carcinoembryonic antigen (CEA) describes a set of highly related glycoproteins involved in cell adhesion normally produced in gastrointestinal tissue during fetal development, but only at very low levels in adults. Specificity: Recognises human carcinoembryonic antigen. Application Notes: This antibody binds to carcinoembryonic antigen and was used in the diagnosis of mammary carcinomas. Note on publication: Describes the use of this a radiolabeled version of this antibody in breast cancer imaging. 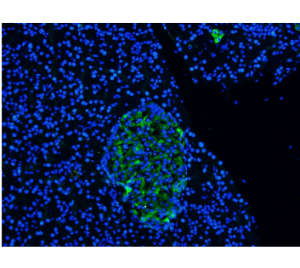 Immunofluorescent staining of rat pancreas using anti-CEA antibody Ab00281 Formaldehyde-fixed rat pancreas slices were stained with Ab00281-10.0 at 5 µg/ml and detected with a FITC-conjugated secondary antibody. Ab00281 shows cross-reactivity with rat. 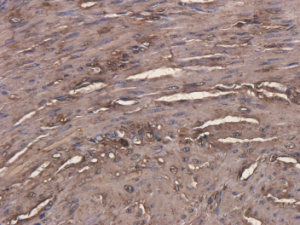 IHC on human endometrial cancer using Ab00281. 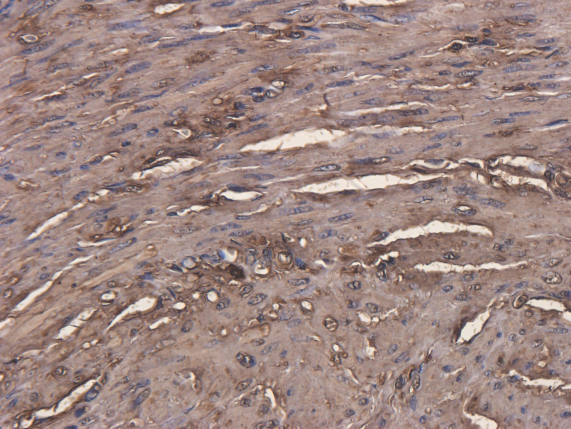 Immunohistochemical staining of human endometrial cancer using anti-CEA antibody Ab00281 Formalin fixed human endometrial cancer slices were were stained with a Ab00281-10.0 at 5 µg/ml.